Healthy and Delicious Recipes and Easy ways to Cook them. There are several ways to enjoy cooking and eating healthy . If you are not an experienced cook then the thought of opening the cabinets in the kitchen could even frighten you . When you are trying to eat healthy it is helpful to learn to how cook . Learning to cook can be easy if you start with simple recipes and easy cooking methods. In the lets start cooking articles below there are step-by-step cooking instructions and easy recipe ideas that will help the beginner cook and the experienced. So grab your aprons and lets start cooking. When you are sauteing you should have all meats and vegetables prepared and ready to cook. Have your saute pan heated to medium heat so that when foods hits the pan it starts to cook immediately. When choosing a saute pan you want the opposite than a wok. Choose a pan that is wide with short sides and make sure your pan is good quality cheaper saute pans normally do not last long in your kitchen and they cause your food to burn. Only use enough oil or clarified butter to saute if you over use you just end up frying your food. Remember we are searing normally ½ oz to 1 oz of oil will saute perfectly. When you are marinating or using wet foods make sure the minimum amounts of moisture enters the pan water and oil do not mix. This could cause popping and you could get burnt. 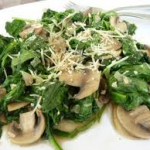 Clean the spinach and mushrooms in cold water to make sure it’s extremely clean. Dry spinach with paper towel , leaving just a little water on the leaves. Adding water to oil will cause popping. In Saute Pan , heat up the olive oil and saute the garlic over medium heat for about 1 minute, . Add all the spinach, Mushrooms the salt, and pepper to the pot, toss it with the garlic and oil, and sate it for 2 minutes. , turn the heat on high, and cook the spinach for another minute, stirring with a wood spoon, until all the spinach has been sauteed down. Sprites with lemon or lime and toss . Enjoy your sauteed spinach with chicken ,Seafood or beef. Burlington Cross Training provides Cross Training workout routines and Mixed Martial Arts (MMA) workout routines for both strength and conditioning. We are located in Burlington, NC and serve Burlington, Elon, Gibsonville, Glen Raven, Alamance, Haw River, Glencoe, Bellemont, Graham, Mebane, Swepsonville and surrounding areas of North Carolina. We have training classes every Monday, Wednesday, Friday and Saturday's and also have one-on-one private instruction. We can work with you to get you in the best shape of your life and ALL of our workout routines can be adapted regardless of your current fitness level. Contact us today at our Burlington, NC training facility for a FREE class and information session. Burlington Cross Training of Burlington, NC uses Cross Training and Mixed Martial Arts training techniques for all our our strength and conditioning workout routines. We combine Cross Training workout routines with our extensive mixed martial arts (MMA) conditioning experience to create a truly unique strength and conditioning program in Burlington, NC. You will get in Cross Training shape while learning how to "fight" like a professional mixed martial artist. Contact us today at our Burlington, NC location. Burlington Cross Training of Burlington, NC uses Cross Training workout routines and Mixed Martial Arts training techniques for all our our strength and conditioning workout routines. We combine Cross Training workout routines with our extensive mixed martial arts (MMA) conditioning experience to create a truly unique strength and conditioning program in Burlington, NC. You will get in Cross Training shape while learning how to "fight" like a professional mixed martial artist. Contact us today at our Burlington, NC location.